This is a brand new dress in a very current style. 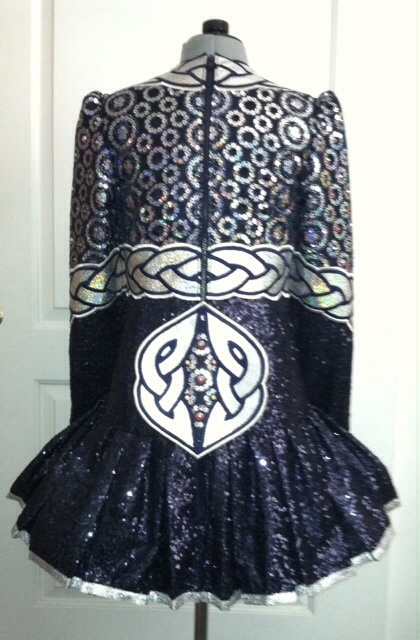 The main body of the dress is a navy blue all over sequin fabric which sparkles beautifully. The top of the dress is an organza fabric with sequin circles, under this fabric is a navy blue satin. 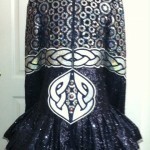 The celtic knot designs are in a holographic silver fabric, every detail of this dress sparkles. The skirt is a pleated goblet style. The dress is lined with black cotton fabric, the skirt is lined with a metal shiny Lycra in bright colors and comes with matching bloomers. 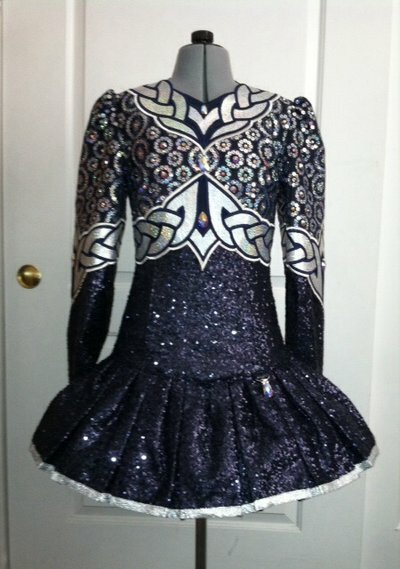 The dress is also decorated with Swarovski AB crystals and some large pear shaped stones. If you have any further questions please email me. There is let out room on all seems and at least 2 inches for let down to lengthen the dress.